Cold War Air Museum: Davy Crockett! - King of the wild frontier. Those of us that remember both the Army newsreels and the Walt Disney movies of the 1950's, recognize the juxtaposition of a line from a popular kid's jingle and the name of a fearful nuclear weapon. Based on recoilless rifle designs of WW2. 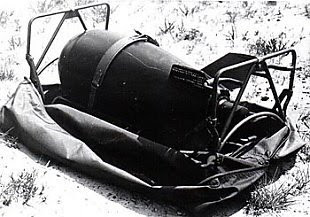 This weapon was the smallest nuclear delivery system publicized and distributed in quantity during the cold war. As the threat of Soviet invasion loomed over Europe, US Army officials decided they needed a tool for halting – or at least delaying – the endless column of troops and tanks expected to pour through the Fulda gap. At seventy-six pounds, thirty-one inches long and eleven inches in diameter, it vaguely resembled a watermelon with fins. 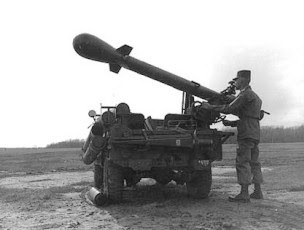 When attached to its launching rod, the munition was perched on a firing tube of 4" or 6" diameter, giving it a range of one to two and a half miles. Serviced by a three man squad, each of these mutually-assured-destructive devices could be launched from a jeep, personnel carrier or even a man-portable tripod. 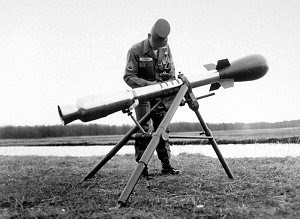 The Atomic Battle Group was charged with the protection of Europe between 1961 and 1971, and during those years 2,100 of the Davy Crockett Weapons Systems were created. In the event of a Soviet invasion, elite squads would deploy in the path of advancing formations. A flurry of mathematics would provide the trajectory and flight time to the target and a test shot from the integrated 37mm spotting gun would verify the calculations before a timer on the warhead was set to detonate the weapon roughly twenty feet above the target with a yield of ten or twenty tons of conventional explosive. Even with the help of the spotter gun, accuracy was limited and detonation might be several hundred feet from target (a catch phrase of the era was "close doesn't count, except with horseshoes, hand grenades and nuclear weapons"). While the weapon's relatively small yield limited its physical damage (by comparison to other nukes of the day), its tendency to spew radiation made up for its shortcomings as an explosive. Any person within a quarter-mile faced almost certain death, even behind the armor of a main battle tank. The minimum time delay setting provided for a distance of about 1,000 feet, but a detonation that close (or a malfunction) would almost certainly result in the death of the firing team. As with all recoilless and rocket weapons, the exhaust zone behind the launcher was a danger zone as well. It was a fear-inspiring weapon indeed. In addition to being the smallest nuclear device announced by the United States, the weapon also had the distinction of being the last atomic device tested by the US in the open atmosphere.